Just finished a lesson presented by Toni Burt as part of Olga Furman's Paint Your Heart and Soul 2019. This was the second time I broke out my set of gouache paints since I bought them. I love how these paints work like watercolors (still in the beginning stage with this medium) yet have greater opacity, somewhere between watercolors and acrylics. There was a great lesson on mixing earthy colors (flesh and other tones). 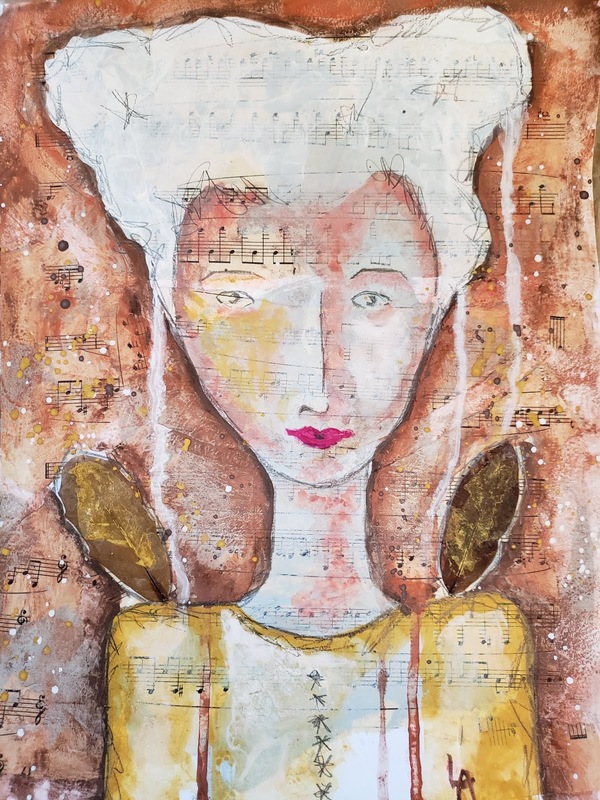 The picture was created over a collaged background using sheet music adhered and sealed with matte gel. The face and features were lightly sketched with Cretacolor graphite pencil prior to painting. Gouche was built up in several layers (burnt umber, burnt sienna, yellow ochre, white). Wings courtesy of our oak tree.